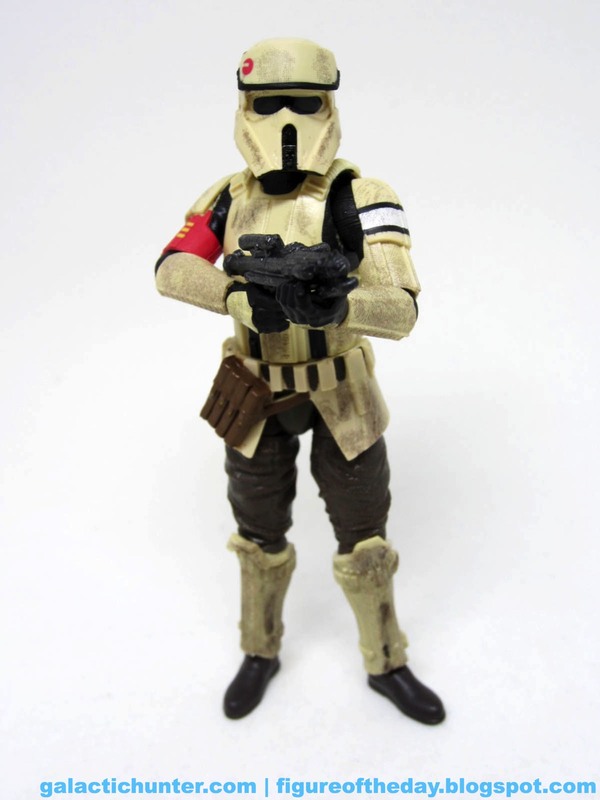 Commentary: For reasons unknown, Walmart gets to sell the basic troop-builder flavor of the Scarif Stormtrooper. A regular basic version shipped late December as part of the final-so-far wave of the line, but if you want super-articulated ones - and you do - get this one. 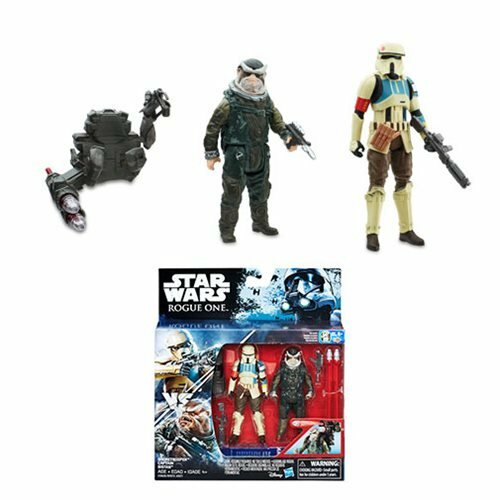 Hasbro basically put the 6-inch Walmart exclusive Scarif Stormtrooper in the reduct-o-matic. You get 28 points of articulation and good - but not as good as the bigger figure - deco. I like the weathering in the smaller figure better, and if by some miracle these start hanging around I'll be picking up more of them. The red bicep, the white shoulder stripe, the three yellow boxes, even the painted vents on the back are all here. The newfangled Stormtrooper blaster - with what I guess is a second scope, and a different magazine - is here too. Thanks to the new hip articulation he can actually sit fairly well, better than the AT-ACT Driver which is a garbage figure and significantly more expensive. I assume some fans will just buy these and paint them white for better, if less accurate, results. 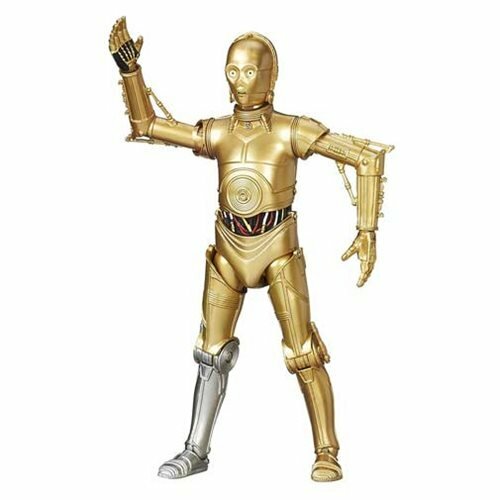 The thing which makes these figures stand out - a real evolutionary move here - are the thigh swivels. This means he can go in vehicles easier, although the stiff skirt piece will be its usual problematic self. I've seen worse ones. 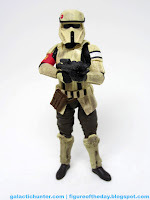 The paint job is nice, and the shin armor is molded in tan rather than painted like the larger version. You'll dig it. 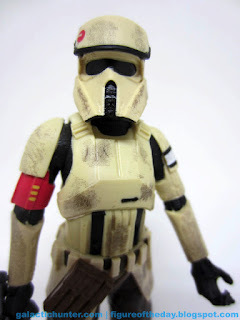 As with Jyn and the others I've opened, Hasbro eschewed rocker ankles in favor of the ones that served them well since 2003. I guess you can't win 'em all, or someone just forgot to put them in. I assume the latter is more likely, but we do have bend-and-swivel wrists here and for two-handed shooing that's a bit more important. 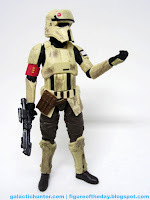 I'd really rather have both, and I hope Hasbro gives some thought to doing more Scarif troopers down the road including these and maybe the other troop deco markings. You've just gotta get one (six) of these if you like 3 3/4-inch figures. I liked The Force Awakens' mini-Black Series line but I'm really in love with Rogue One's offerings thus far. Do yourself a favor and buy them if the opportunity makes itself available. My feeling about Rogue One - and I may be dead wrong - is that you should snap it all up now without hesitation. The limited potential for spin-offs means Hasbro may take a while before revisiting these guys - so just get while the getting is good. 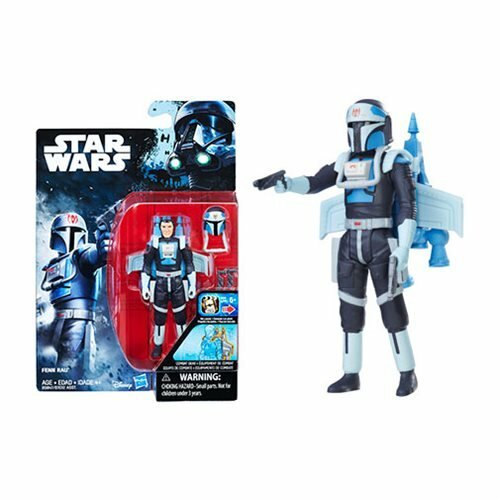 To date I'm only counting 12 released basic figures, 4 Black Series 3 3/4-inch figures, 6 figures from 2-packs, 5 unique "pilot" figures, and about a half dozen or so from various retailer exclusive multipacks. It's a tight run. Collector's Notes: I got mine from Walmart by way of pal Matt. Thank you Matt!